Do you clean your car interior regularly? It is important to clean not only the exterior of your car but the interior as well. After all that is where you and your family and friends spend time. A clean car interior can make even a short ride much more enjoyable than it is in a dirty car. If you are not savvy in cleaning your car interior, you can call us now and book our professional car upholstery cleaning service, as we are the best company that provides such a service in Hammersmith. 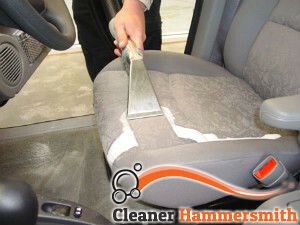 Our car upholstery cleaning service is accessible to everyone who needs it. We have created our service in a way that it has affordable rates and everyone can take advantage of it. Because we understand how important it is to maintain your car upholstery perfectly clean and if you cannot do it on your own, we will do it for you. Our cleaners will come equipped with professional cleaning agents for each type of upholstery fabric, and with steam cleaning machines that are safe to use on most car upholsteries and do not only clean but also deodorise them. 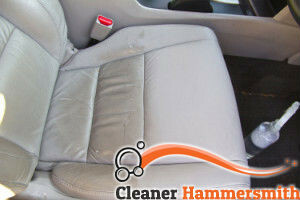 You can trust us with your car upholstery cleaning and we will make your car interior feel brand new again. We can get rid of nasty odours, soil and dust, various stains, etc. and we will leave your car ideally cleaned. You can call us any time and make an appointment we are available in Hammersmith, W6 and will be expecting our call. Let our professionals take care of your car upholstery.